Enhance the curb appeal of your home using this Whitehall French Bronze Deluxe Mailbox, Post, and Brackets package. This bundle includes a generous, recycled aluminum mailbox and a matching post for a lovely support. The traditional shape of the Whitehall French Bronze Deluxe Mailbox adds a classic look to your curb, while its large capacity can hold a few days worth of mail. The magnetic door closure keeps your mail protected from the elements, and a small orb at the top adds unique style. This also matches the topper on the included Whitehall French Bronze Deluxe Mailbox Post and Brackets, for a unified look in your yard. Two ornate brackets, each sporting light scrollwork, affix to the aluminum post in moments, easily accommodating the mailbox. Place a wooden 4 x 4 post (not included) inside the aluminum sleeve for strength and durability when placed outdoors. The bronze color of each piece furthers the classic look, and the gold hue on the mailbox flag adds a fun bit of shine. 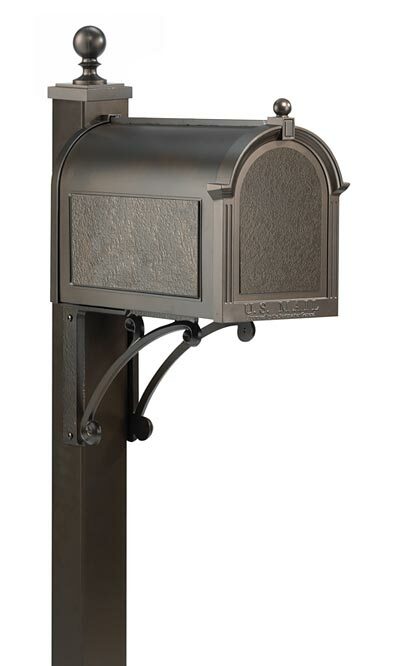 Turn your mail receptacle into a stunning yard accent with this French Bronze Deluxe Mailbox, Post, and Brackets package. Assembly required.